As the leaves turn colors and fall off the trees, we can expect the insect population to die down a bit here in Jacksonville. A drop in temperature can cause many bugs to die out. However, there are still common fall pests that you will have to deal with. In the months where the temps drop a bit, there are a few different pests you can expect to see in Northeast Florida. Scorpions - Scorpions have eight legs and a curved tail. Most people are familiar with the threatening tail they wield. These are not the type of pests that you want in your home or on your property. Crickets - Crickets get in your home and hide in corners. It can be very difficult to find them, because their chirps don’t seem to come from where they are sitting. Many people do not appreciate the chirping while they are resting at night. Bed bugs - Bed bugs can live in your home pretty much any time of the year. These insects get into your mattress and bite you while you sleep. It is hard to know you have an infestation until they bite. That is why prevention is your best bet. Head lice - It can be frustrating to deal with a lice breakout. Even after you wash everyone’s hair, the lice can live in the house. In order to get rid of an infestation, it will require you to spray bedding, furniture, carpets, and pillows. Fleas - Fleas can live in the carpet and furniture of your home as well as on your animals. Even after treating your pets, you can still deal with this issue. 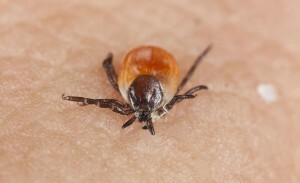 Ticks - Ticks are still out and attacking your pets in the fall months. These insects can carry diseases that affect you and your family. It is important to rid your home of these pests. Even if you do not see these insects, they may very well be hanging around. Our fall bug prevention program will ensure you home and family are safe from these bugs that hand ground in the cooler weather. Here at Bug-Man Pest Control, we offer professional solutions to common fall pests. Our team of experienced professionals can ensure your home will stay pest free during the fall season. With our specifically formulated products and advanced techniques, we can take care of all of your fall bug prevention needs.